I had my car transported from NOIDA to Pune and it took them 15 long days. The mistake I did was I gave them full tank and when it reached Pune the tank was empty. It seems my car was used for agarwal's domestic purpose for full 10 days. When it reached Pune, it was as if the vehicle was driven and not in brought in the Car Carriers. Whe you try to follwup, first they will pick your call then they take note of your number and then will never pick up the call. 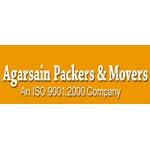 My suggestion is NEVER use agarsain Packers and Movers. Customer Service is to dogs and they don't know what is meant by staff Courtesy.